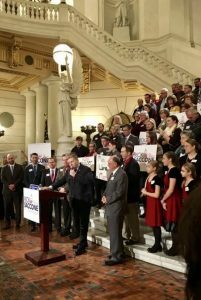 State Rep. Rick Saccone officially kicked off his campaign against Senator Bob Casey in the Capitol Rotunda in Harrisburg, making him the first Republican in the race. “President Trump was elected to go drain the swamp, and I want to go and help him,” Saccone said during his announcement. Saccone, of Allegheny County, says he will point to the differences between himself and Casey. “The people are mad at him, and want him out of Congress. He is a career politician and is out of touch with the people,” he said to PoliticsPA after the announcement. Casey’s team declined to comment. American Bridge, a Democratic super PAC, chose to attack Saccone’s lack of statewide name recognition. Saccone filed his statement of candidacy earlier this month with the FEC. Saccone currently is serving his fourth term in the State House. An Air Force veteran, he remained in South Korea after retirement to host an English language newscast. He holds a Ph.D in International Affairs from the University of Pittsburgh and has taught classes at Saint Vincent College. Presently, Saccone is the only Republican in the race. Congressman Pat Meehan announced his decision not to run earlier this month. Others possible candidates include House Majority Leader Dave Reed, and Congressman Mike Kelly. I plan on voting for Libertarian Dale Kerns. Having already predicted that 2018 will be a bad year for GOP due to Trump, I should add that Rick Saccone is a well-qualified candidate who would make an excellent US Senator. Rick Saccone is a much better man than Bob Casey, Jr.
2018 will be a bad year for Republicans as Demicrats will turn out heavily to vote against Trump. The fact that Meehan, with his network of fundraisers, declined speaks volumes. They see this race as unwinnable and a poor investment. It’s the same reason why the Rs tried so hard to find a self-funder in 2012. The irony is they would be best served by a guy like Steve Welch – a southeast moderate (relatively speaking) who could self-fund and actually present a challenge in the general – but he could never make it through the primary. Same old, same old. Why is Bob Casey more likely to lose now than when he ran against and knocked off a formidable incumbent? He is not likely to lose this time. Doubt that Majority Leader Dave Reed would flip and decide to run for Senate. He was standing up for Rick Saccone as the first speaker at the rally. Liberal Republican Kate Harper is the southeast is putting out feelers. I would think she would be the choice of Val DiGiorgio and the Establishment of incompetent cronies getting rich losing elections. Denny Bonavita is right that no one is “mad” at Bob Casey; he is true gentle man, impossible to dislike, and personifies family values. Bob Casey may be pro-life personally but personnel is policy and I would think he votes for Planned Parenthood funding or, at least, not against Planned Parenthood.And, of course, the Supreme Court vote may expose his less than committed pro-life beliefs. He is not a proponent of charter schools although I would think, as having attended Catholic schools, not as ideological as the Leftists who need to control the curriculum. I think Casey’s union support will be solid. Rick Saccone’s challenge is money which will not be a problem for Bob Casey. Uh . . . how was an individual’s political campaign allowed to be kicked off inside the Capitol? Yeah, I know, I’m not particularly shocked that politics goes on there, but should it be allowed? The fronts steps are pretty big and definitely okay with me. But inside? I would add that if Rick Saccone can energize the Trump voters outside of southeast, his candidacy becomes viable. The Inquirer’s infographics are excellent and show that the Democrats shellacked Donald Trump in the southeast; the Democrats, in fact, increased their voter margin in the southeast, it was the shellacking that Trump Voters delivered outside southeast that determined the narrow win. Scott Wagner will, also, be running in 2018 and I think Scott Wagner voter will be a Saccone voter. Scott Wagner is NOT a social conservative as is Rick Saccone so the reverse may not be true. But at state level, it will be the fiscal issues that dominate, in my view. Supreme Court vacancies will energize Saccone and Trump voters. Joe Gale will be running again in MontCo and I think he will energize southeast Trump voters. I hope Rick Saccone will run as a Trumpian. Saccone will be attacked as a religious fanatic, white supremacist, anti-science bigot, Irredeemable Deplorable clinging to his gun and his Bible etc., etc that Democrats always use against any Republican. Because Donald Trump has put the agenda-driven, ideological and partisan media on defense and because other means of getting message out have grown, Rick Saccone may be able to raise the money he needs. Scott Wagner is a common sense fiscal conservative who cannot be bought and knows the simple fact that when expenses exceed revenue, your organization is in trouble and Pennsylvania is in decline. Scott Wagner is no dope and, most important, like Donald Trump, “he cares” what happens to Pennsylvania. The Democratic Party is far to the Left of Bob Casey. TPP and trade issues will undermine his Union support to some extent. The Democrats hold the black vote by “welfare” and “free stuff” and when blacks see, by 2018, that not only have their welfare and free stuff has not been cut but that jobs have increased, crime down and charter schools (“No child should be forced to stay in a failing school”) more available, I think the bloody flag of “Racism” will have less appeal. Both Saccone and Wagner have to face the cronies in Republican State Committee and its lobbyist/StradleyRonon lawyer Val DiGiorgio as the “controlled opposition”. While Trump claimed he was going to drain the swamp, he’s caused a massive flood of that same swamp. That in itself won’t come close to getting Saccone elected to the US Senate. Saccone’s quotation is wrong. The people are not ‘mad at” Casey. Casey is a nice guy, personally. Even those of us who disagree with him on issues understand he works hard, he does not offend — and he has the advantage of being pro-life, which is going to keep some Republicans voting for him. I don’t think many would dispute this put-down by Mackler. This is the issue from the start. Saccone is indeed a committed and capable candidate, and has done well as a state Representative. And he would probably do better than Casey were he to win in 2018. Problem is, very few Pennsylvanians know who Saccone is. And despite any positives for Saccone, Casey has a few impressive positives of his own. Incumbency is probably the biggest one. Family name and background is another that works to his advantage in this state’s politics. And Casey does and says little. While this would ordinarily work against him, it also means he has said or done little that can get him in trouble. The man is certainly Mr. Low-Profile. And he even does a little more than lip service to some bypartisan issues. However, Casey has said some very silly, unnecessarily partisan things (when he could have said much less or remained silent and just voted) regarding Trump’s cabinet appointments that certainly may not help him. A skilled challenger in 2018 will ensure they come back to haunt him. Nevertheless, Casey’s comeback would probably be that he is, after all, a Democrat. At least he has behaved reasonably well as a member of the loyal opposition. Saccone or another challenger needs more than that. And that is likely to come with regard to the current SCOTUS nomination. Casey has been quite cagey on Gorsuch and clearly does not want anything he does regarding the confirmation be an issue in 2018. Other Senate Democrats up in 2018 are also treading cautiously. And this prudent political behavior might help them, even if the DNC forces a nuclear option. The real peril will come if the Trump adminstration actually leverages an economic revival, and if the Democrats in Congress are seen as vain and partisan opponents to bringing back jobs and a better standard of living. Casey will have to fight hard to avoid sharing any blame. Another near-term SCOTUS vacancy before the 2018 election could also complicate matters for Casey and other Senate Democrats up for re-election. Considering what lies ahead, Saccone is certainly wise to declare early. But unless he overcomes his main PR obstacle–name non-recognition–he will constantly loose momentum on each issue as he keeps having to introduce himself. If he can’t do this, even the strongest and most reasoned replies to anything Casey says and does may not get much if any press coverage. Saccone should also consider why Marino and Barletta, favored at the White House and by the RNC, don’t seem to show much interest in challenging Casey. The latter, despite any faults, remains a very hard target for 2018. This could change, but anyone wanting to unseat him should prepare for a long, hard-fought campaign against the odds. congrats on announcing your bid but i’m still planning on supporting the incumbent us senator instead. Basically if Daryl Metcalfe had a mustache. Saccone is indeed a sack of one.